The January BOM (bread-of-the-month) for the Facebook Artisan Bread Bakers Group is a recipe that many of my baking acquaintances make on a regular basis. 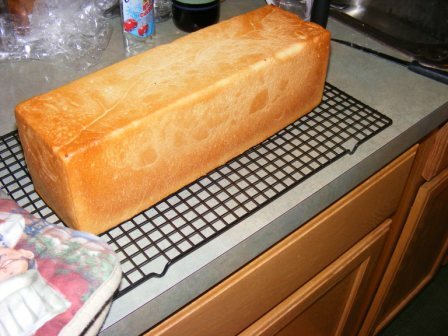 In fact, several of them bake this bread weekly as their everyday sandwich bread. I was excited to try this recipe and actually made it twice — once in a regular loaf pan and a second time as a double recipe in a pain de mie pan. 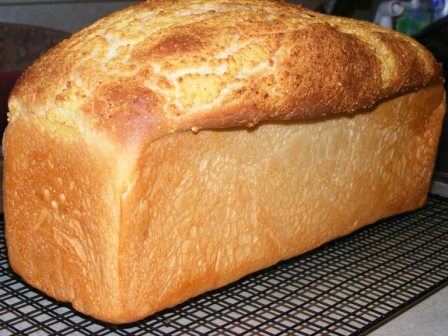 This is a delicious bread that’s great for toast, sandwiches, grilled cheese, and French toast. It’s nothing fancy, but it’s perfect for a daily bread. 1. 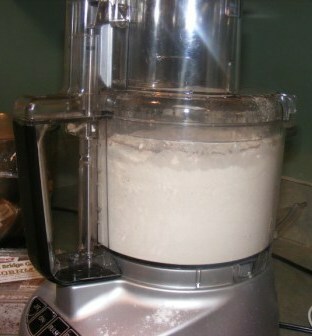 Simple mixing method: place all ingredients in bowl of mixer. Mix with dough hook until it comes together in a shaggy mass. 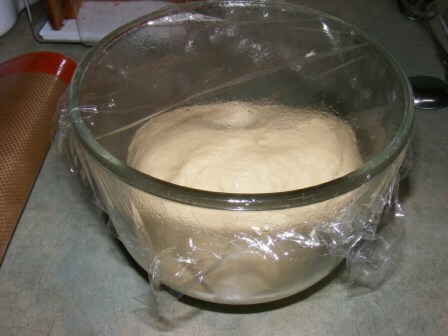 Cover the bowl and allow dough to rest for ten minutes. Mix on low for ten seconds. Cover bowl and allow to rest for ten minutes. Continue with step 6. 2. 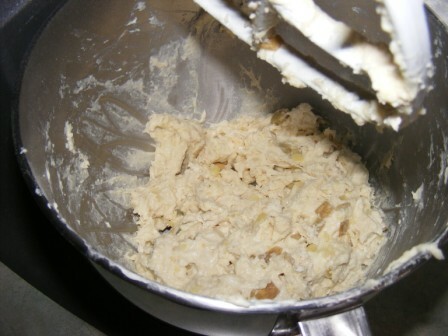 Traditional mixing method: Place the yeast, milk and syrup into a large bowl and whisk together. 3. 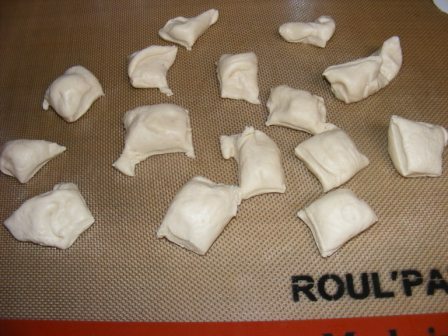 Add the flour and salt and mix with your hands to bring together as a soft, sticky dough. 4. Pour over the warm melted butter and mix this into the dough with your hands, then cover the bowl and leave to stand for ten minutes. 5. Grease your hands and a flat clean surface with olive oil. 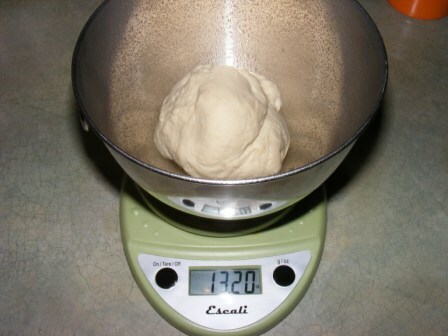 Remove the dough from the bowl and knead for ten seconds, then form the dough into a smooth round ball. 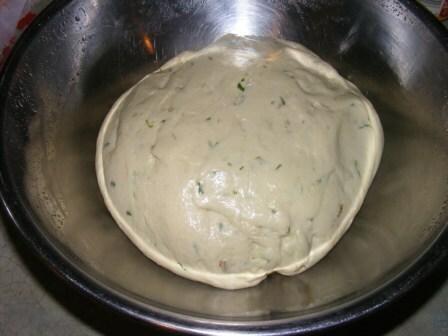 Wipe the bowl clean and grease with olive oil, then return the dough ball to the bowl and rest for a further ten minutes. 6. Repeat this ten-second kneading and resting process every ten minutes twice, then allow the dough to rest for 30 minutes. 7. 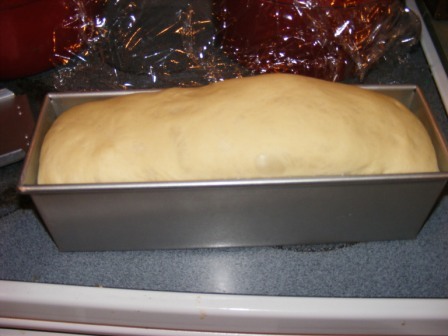 Grease a deep 5×8-inch loaf tin and dust with flour. 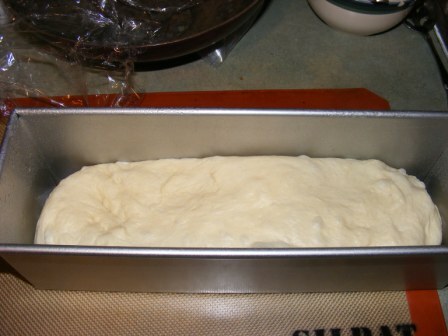 Divide the dough into two equal pieces, shape into two balls and place side-by-side into the loaf tin. 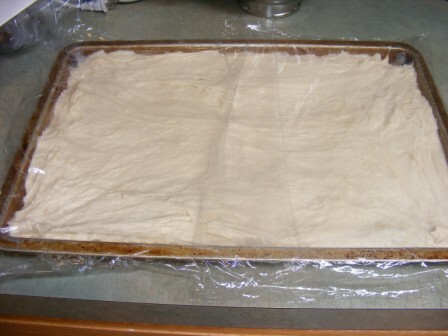 Cover with a cloth and leave to rise for one and a half hours, or until almost doubled in height. 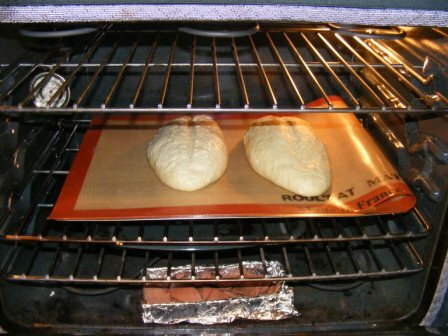 About 20 minutes before the bread has finished rising, preaheat the oven to 410°F. 8. Brush the top of the loaf with a little milk and place into the preheated oven to bake for 15 minutes, then reduce the heat to 350°F and bake for a further 25-30 minutes, or until the top of the loaf is a shiny dark brown and the loaf has come away from the sides of the tin. 9. Remove from the tin and cool on a wire rack. 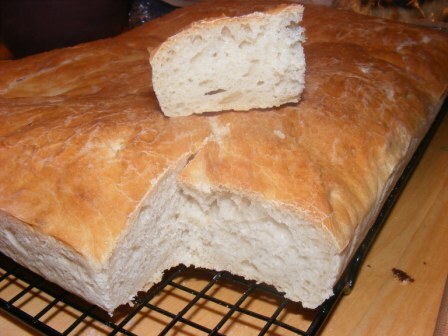 The sixth recipe in the Breads section of the Modern Baker Challenge is Instant Sandwich Bread. 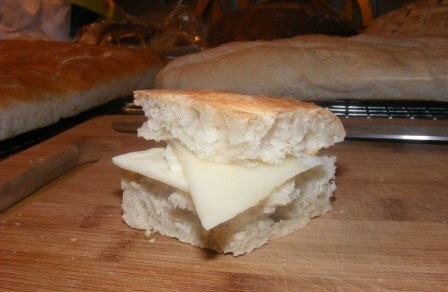 Although I have to say it was unlike any sandwich bread I’ve ever made. It’s baked in a sheet pan, so you don’t slice it like a loaf of bread. Rather, you cut squares like you would a sheet cake, then split the squares laterally to use for sandwiches. 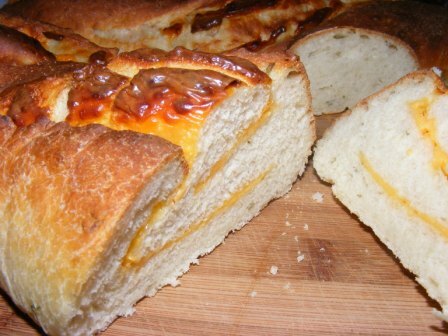 This is another bread recipe that is mixed in a food processor. I have a Cuisinart 11-cup food processor, which I believe is standard size for most home kitchens. There is a 14-cup model, but I don’t know anyone who has one in their kitchen. Except, apparently, Nick Malgieri. As I began to mix the ingredients in the food processor, it seemed too full to me. But I pressed on. The dry ingredients were OK. But when I added the water and yeast, and then turned on the machine, my problems began. The liquid came shooting out of the top and bottom of the machine. 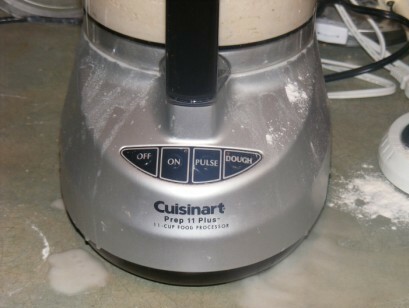 But at this point, I was committed (or should have been), so I kept processing until the dough seemed well mixed. Moral of the story: unless you have a 14-cup food processor, I would recommend mixing this dough in your Kitchen Aid or by hand. The dough didn’t seem to have suffered too much for the loss of water, so I turned it out into a bowl and let it rest for about 30 minutes. Then I pressed the dough into the pan, where it proofed for an hour. I baked the bread for about 25 minutes, until it was puffy and golden brown. My daughter loved this bread. She didn’t use it for sandwiches; she just cut chunks and ate them. I made one sandwich (pictured at the top of the page). It was good, and I can see how this loaf might work well for making party sandwiches. 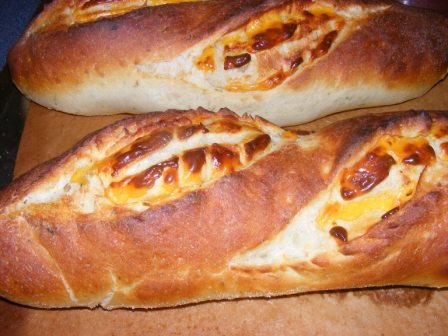 But to be honest, it didn’t rank among my favorite sandwich loaves, and I doubt if I will make this recipe again. Potatoes and Cheddar and Chives — Oh, My! Having recently baked one really good (Vienna), two so-so (Pain de Mie and Whole Wheat), and one yuck (Tuscan) breads in the past few weeks, I had high hopes for the 42nd and next-to-last recipe in the BBA Challenge, Potato, Cheddar, and Chive Torpedoes. In fact, I will admit to expecting a lot out of the last two recipes in the book. After months of baking, with mostly great results and only a few duds, I really hope to go out with a bang here. And if this bread is any indication, PR will not disappoint. One of the interesting things about this bread is that it uses both sourdough starter and yeast to leaven the bread. 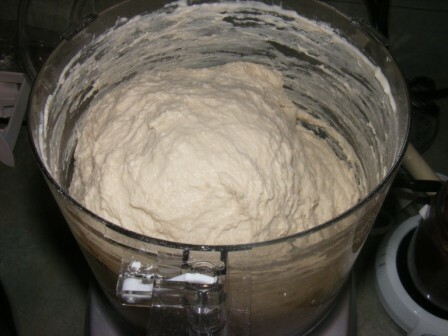 The sourdough starter (which PR incorrectly refers to as a “barm”) is built from the Mother Starter. The recipe requires 10.5 ounces of starter. The starter recipe, on the other hand, yields 39 ounces. Time for baker’s math again. By using 1.9 ounces of starter and 4.3 ounces each of flour and water, I ended up with exactly 10.5 ounces of 100% hydration starter for the recipe. I prepared my starter the evening before I planned to bake and let it sit out at room temperature overnight. The next day, I chopped and boiled Yukon gold potatoes, then let the potatoes and potato water cool to room temperature. I decided to use Yukon gold, as I thought they would give the crumb a nice color. While the potatoes and water were cooling, I chopped the chives and assembled my mise en place. I bought the chives in a small package at the grocery store. When I got them home and started chopping them, I realized that my $2.59 got me only 2/3 ounce of chives. And by the time I culled out the bad ones, I had about 1/2 ounce left! It killed me to realize that within a few months I’ll have chives coming out my ears in the garden. In fact, the chives often poke out through the snow early in the Spring. OK, enough of my chive rant, back to the bread. I mixed 1/2 of the flour, 1/2 cup of the potato water, the potatoes, yeast, and starter just until the flour was hydrated. I allowed this “shag” to sit for about half an hour. Then I added the rest of the flour, the salt, and just under 1/2 cup of potato water and kneaded the dough for about six minutes with my Kitchen Aid. I added the chives and mixed another two minutes. The dough was very tacky, bordering on sticky. I put it in an oiled bowl and turned it to coat the dough with oil. 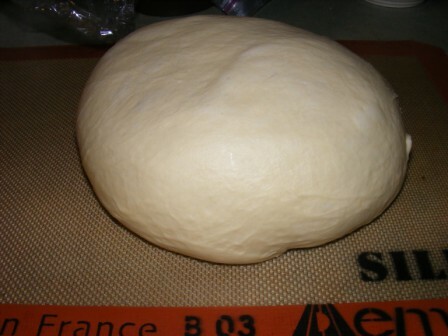 After a 90-minute ferment, the dough had more than doubled in size. I dumped the dough out onto my Roul’Pat, divided it in half, and patted one half into a rectangle. 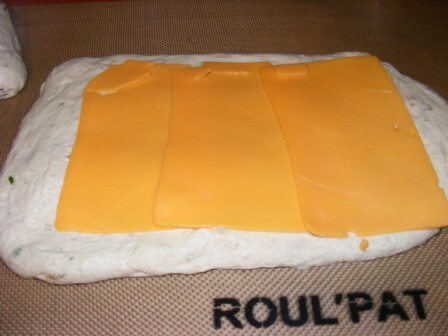 I layed out half of the cheddar cheese on the dough, leaving the edges uncovered. 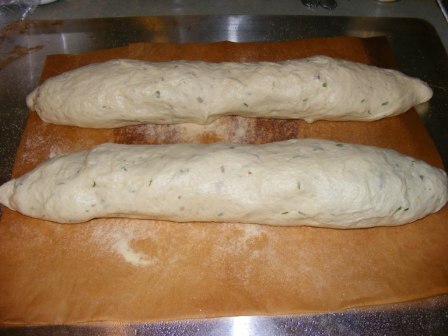 I rolled the dough into a batard, sealed the edges, then tapered the ends to make a torpedo shape. Then I repeated this with the second loaf. I misted the torpedoes with spray oil, covered them with a towel, and allowed them to rest for one hour. About 15 minutes into the proofing period, I began preheating my oven to 500 dF with a steam pan on the bottom shelf. Just before loading the bread into the oven, I boiled some water and slashed the loaves, being sure to cut down to the first layer of cheese. I was a little nervous about this part. I’m a pretty good slasher, but I have never worried too much about the depth of my cuts. I was afraid they would be too shallow and require a second or third slash to get down to the cheese. I needn’t have worried. As you can see, one slash was all it took, and they were ready to bake. I loaded the loaves into the oven, poured a cup of boiling water into the steam pan, closed the oven door, and reduced the temperature to 450 dF. I don’t bother with spraying the oven walls at 30-second intervals, as I can’t discern any difference in the loaves one way or the other. I think the steam pan works fine for creating the proper amount of steam in the oven. I baked the loaves for about 20 minutes and rotated them 180 degrees. I inserted a probe thermometer into one of the loaves, and was surprised to find that it was already over 200 degrees in the center. The recipe said the torpedoes would take 35 to 40 minutes to bake, but mine were done after 20 minutes. The loaves looked and smelled amazing. The cheddar bubbling out through the slashes was especially striking. I honestly wasn’t sure if I could wait 45 minutes before slicing into this bread. But wait I did. When I sliced the first torpedo, the crumb, with its spiral of sharp cheddar cheese, was as beautiful and enticing as the loaf had been coming out of the oven. And the flavor? Well, let’s just say that I finished half the loaf standing in the kitchen before I thought to offer any to the rest of the family. I had more this afternoon toasted. It was like eating the best grilled cheese sandwich you’ve ever tasted right out of the toaster. This was easily my favorite bread in the past few months of the BBA Challenge. 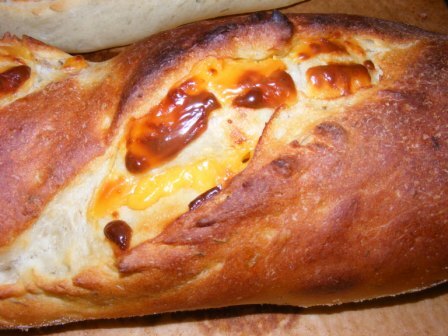 In fact, it ranks up there with Casatiello as one of the top breads in the book! Up next: Roasted Onion and Asiago Miche, the final bread in the Challenge. As fate would have it, as we near the end of our Bread Baker’s Apprentice Challenge journey, in which we have baked everything from French and Italian breads to celebration breads to breads filled with meat and cheese, for the fortieth bread in the Challenge, we hit on a very simple (some might argue too simple) white bread. The French call it pain de mie, which translates to “bread of the crumb” but is really just a fancy way of saying everyday sandwich bread. I wasn’t as ambivalent about this bread as some BBAers, like Paul from Yumarama. In fact, I really liked it toasted with homemade jam. But I can see his point. It’s not what you expect this late in the game. This is more of a first-loaf, getting-your-feet-wet kind of bread. I know the recipes are in alphabetical order. Still, it felt like a bit of an anticlimax to be making such a basic loaf the 40th time out. Note that the Pullman pan gives you a perfectly rectangular loaf, and nice, square slices of bread. Perfect for sandwiches, but not so artisanal looking. Version #3 starts with a quick sponge. Unlike the typical preferment, the sponge is only allowed to ferment for about an hour before it is mixed into the dough. Otherwise, it is a fairly standard enriched dough. It kneaded beautifully and had a nice texture. I didn’t divide the dough after it fermented, as the Pullman pan requires almost 3 1/2 pounds of dough per loaf. 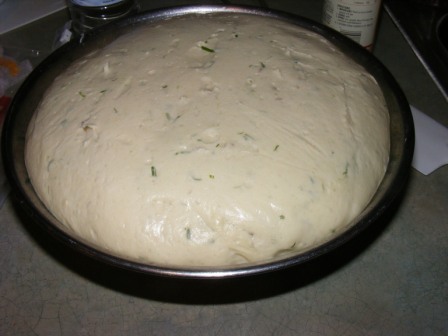 When I made version #1, I allowed the dough to rise until it was about 1/4-inch from the lip of the pan, then I sprayed the lid with cooking oil and slid it on the pan. I began preheating the oven at that point, and baked the loaf with the lid on for about 20 minutes. I removed the lid and allowed the loaf to finish baking. With version #3, however, I decided to use a Dutch crunch topping, which meant I couldn’t use the lid, as I was afraid the topping would all stick to the lid and probably burn. For the Dutch crunch, I used cornmeal, flour, yeast, salt, oil, and water. I brushed it on after the bread had proofed in the pan, shortly before I put the loaf in the oven. I baked the loaf at 350 dF for 20 minutes, turned it 180 degrees, inserted a probe thermometer, and continued baking until the internal temperature reached 187 dF. Check out that crazy oven spring! The top of the loaf was about 1/8-inch below the top rack. And it baked over the sides of the pan quite a bit, too. As far as taste goes, version #1 was a decent, but not remarkable, loaf of white bread. 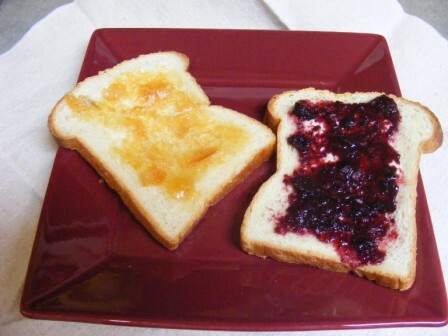 Fine for sandwiches or eating toasted with jam. Version #3 was still not an out-of-the-ballpark bread, but it was much tastier than the first version. I’m not sure whether it was the sponge, Dutch crunch, or a combination of both. I suspect they both played a role in the flavor of this bread. Again, it was a good sandwich bread and great for eating toasted with homemade jam. And it was tasty enough to eat toasted with just butter. 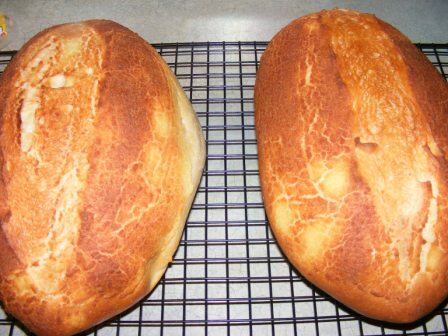 I will make this bread again, as I enjoy making pain de mie to use for sandwiches and toast. I’ll definitely use version #3 again. And probably Dutch crunch, too. I might try using the crunch with the lid on just to see what happens. The next bread in the Bread Baker’s Apprentice Challenge is Vienna Bread, an enriched European bread that is often topped with a slightly sweet Dutch crunch topping. This bread was delicious, especially after the nearly tasteless Tuscan bread. In fact, I enjoyed this bread so much that I made it twice in two weeks. 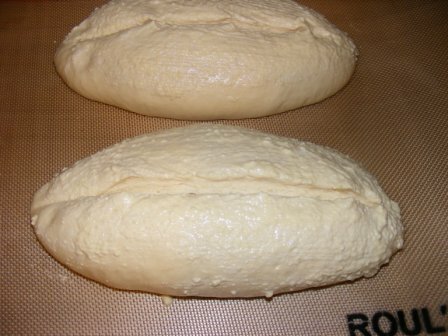 Reinhart’s Vienna bread recipe, like many of his recipes, begins with a preferment, in this case pâte fermentée. The recipe calls for 13 ounces of preferment; but the pâte fermentée recipe in the book makes 16 to 17 ounces of dough. Time to break out the baker’s math! Since the recipe gives baker’s percentages, it was a fairly simple matter to scale it to the amount I needed. I ended up using 4 ounces each of all-purpose and bread flours, 0.15 ounce salt, a scant 1/2 teaspoon yeast, and 5 ounces water. The result was just over 13 ounces of dough, which I allowed to ferment for a little over an hour before refrigerating it overnight. The next day, I removed the pâte fermentée from the fridge, cut it into pieces, and allowed the pieces to come to room temperature. The pieces were then mixed into the dough, which included sugar, butter, egg, and barley malt powder. 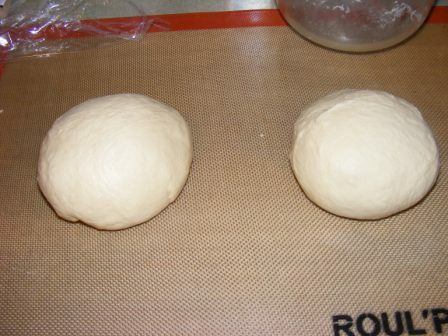 After fermenting the dough for about 2 hours, I divided it in half and shaped each portion into a boule. I allowed the boules to rest for 20 minutes, then shaped them into batards. 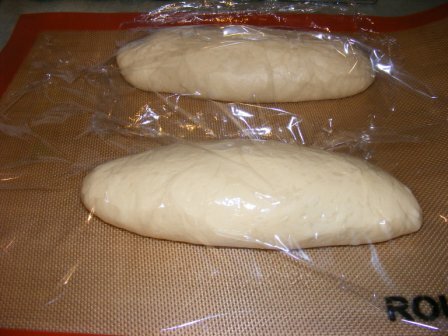 The loaves were covered and left to proof for about 90 minutes. While the loaves were proofing, I mixed the Dutch crunch topping, made from semolina flour, yeast, oil, sugar, salt, and enough water to make a thick, spreadable paste. 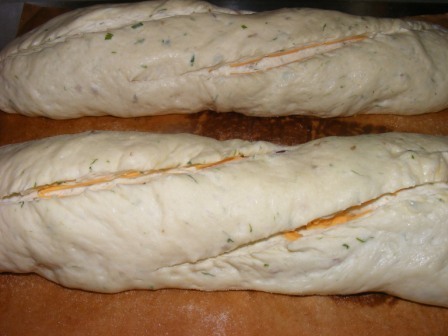 When the loaves were ready to bake, I brushed them with Dutch crunch paste and slashed the loaves lengthwise. Because Vienna bread contains malt powder, it browns more quickly than other doughs. For this reason, the loaves are baked at a lower temperature than many hearth breads — 450 dF. I baked the loaves for about 30 minutes, until the internal temperature reached 200 dF. As noted above, this was a delicious bread, one worth making again and again. And I really liked the look, texture, and taste of the Dutch crunch topping. I’ve never used Dutch crunch paste before, but I think I will find myself adding it to other recipes. So that’s Vienna bread. Up next: the Big Four-Oh — Pain de Mie. Check out Paul’s write up at Yumarama. One of the things I like about blogging is sharing some of the things I’ve learned about cooking and baking, including terms that can sometimes be confusing. I decided to start this glossary to collect some of these words and terms. I’ll add things here as I mention them in my blog and include links to this glossary from the blog entries, and vice versa. There are a lot of food glossaries out there, and I have no intention of trying to make this one a complete compendium of cooking or baking terms. Rather, I want to use it to collect terms that come up in my blog posts. That said, if there are cooking terms that confuse you, drop me a line. I’ll try to add a definition. baker’s percentages (or baker’s math) — in professional and artisan bread baking, recipes are conceived in ratios whereby the total flour in the recipe, by weight, is always 100%, and the rest of the ingredients are presented in relation to the flour weight. So, for example, if you are using 1000 grams of flour, and the yeast is given as 3%, then the recipe would require 30 grams of yeast. fiori di sicilia — literally, “flower of Sicily”, is a flavoring extract with essences of citrus and vanilla. It can be used in place of vanilla and adds a wonderfully subtle flavor to sweet doughs. full rolling boil — often use in jam and jelly making, the term “full rolling boil” means a boil that doesn’t subside when you stir the mixture. hooch — the greyish, brownish liquid that forms on the top of sourdough starter when the starter needs to be fed. Hooch is a result of alcohol production in the starter fermentation process. It can be poured off or stirred back into the starter. 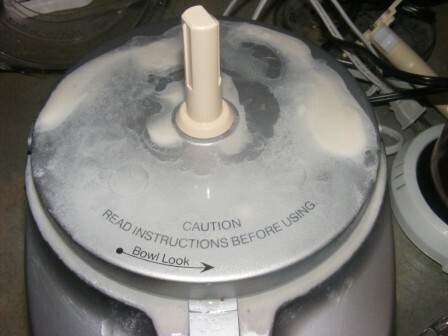 If it is poured off, the starter may require slightly more liquid when fed. mise en place — mise en place (pronounced MEES ahn plahs), literally “put in place” but more commonly translated “everything in place”, is a French cooking term, which simply refers to assembling all of your ingredients and equipment before you begin cooking. You read through your recipe, get out all your ingredients, measure, wash, chop, toast, bring to room temperature, etc., and get all of your pots, pans, bowls, utensils, and other equipment ready. 100% hydration — this term, used with sourdough starters, refers to the amount of water in a starter in relation to the amount of flour, both measured by weight. In baker’s percentages (see entry above), the flour is always 100%, and all other ingredients are measured in reference to the flour. So 100% hydration means that the weight of the water in the starter is equal to the weight of the flour. 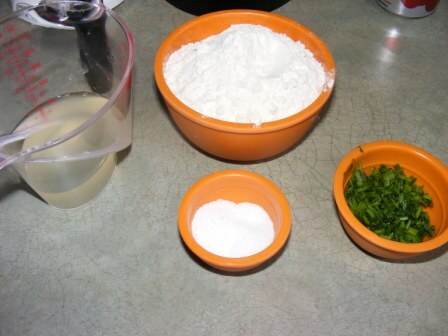 So, for example, if you feed your starter 50 grams of flour and 50 grams of water, the starter would be 100% hydration. pain de mie — is a fancy-sounding name for an everyday sandwich bread. Literally, it translates to “bread of crumb”; but most online French-to-English translators will return “sandwich bread” or simply “bread”. 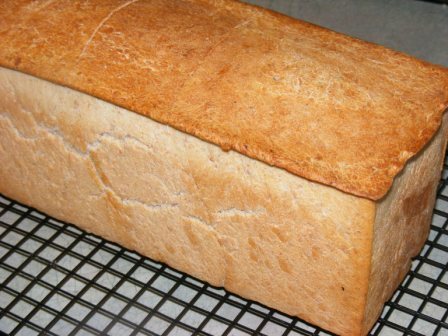 Pain de mie can be made with whole grain, but it is usually just a simple, white sandwich bread, often enriched with milk, butter, and sugar. 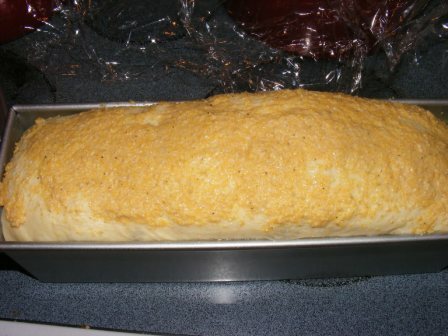 It can be baked in a loaf pan or a Pullman pan (see below). 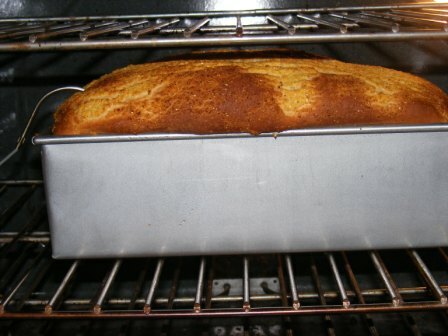 Pullman pan — so named because it resembles the shape of a Pullman train car, this lidded, rectangular pan bakes a perfect pain de mie loaf (see above). Pullman pans come in many sizes, but a “standard” pan is about 13x4x4 inches and holds about 3 1/2 pounds (42 ounces) of dough. soaker— in making a soaker, course-ground grains (e.g., cracked wheat, course-ground cornmeal, oats, etc.) are soaked in a small amount of water or milk overnight. This serves to soften and activate the enzymes in the grains, which improves the flavor of bread dramatically. tacky vs. sticky (dough) — in bread baking, the recipe will often say that the dough should be either tacky or sticky. The easiest way to test this is to press your hand onto the dough and then lift it up. If the dough pulls up with your hand and then releases (so your hand comes away clean), the dough is tacky. If you end up with dough stuck to your hand, it’s sticky.